preferential basis to Camas Investments Pte. * BHARAT FINANCIAL INCLUSION: Completed the first securitisation transaction of 5.50 bln rupees in 2018-19 (Apr-Mar). * CANARA BANK: The Central Bureau of Investigation has filed a chargesheet against two former chairmen of the bank -- AC Mahajan and SR Raman -- in connection with 1.46-bln-rupee loan default by Winsome Diamonds, expanding the list of high-profile bankers booked for alleged involvement in corporate promoters reneging on debt. company, with the state cabinet giving its nod for a proposal to set up a tyre manufacturing unit near here, at an outlay of about 40 bln rupees. * CLARIANT CHEMICALS (INDIA): Has permanently shut its manufacturing unit at Vadodara, Gujarat. operations separate without breaking up the company, India's oil minister said on Thursday. * FORTIS HEALTHCARE: Is in the process of recasting the board of its unit SRL Diagnostics, having removed directors affiliated to Fortis founder and former executive chairman Malvinder Singh, who has been accused of misusing company funds. The findings of an investigation into the company have exposed former promoters Malvinder and Shivinder Singh to further legal trouble with the SEBI initiating a forensic audit and the Serious Fraud Investigation Office suspecting wrongdoing. Defers deadline for submitting binding bids to Tuesday from Thursday. * GMR INFRASTRUCTURE: Promoter GMR Enterprises has acquired 34.2 mln shares or 0.57% stake in the company through open market on Jun 26-28. * HCL TECHNOLOGIES: Will acquire Germany-based Honigsberg and Duvel Datentechnik GmbH for 30 mln euros (approximately 2.39 bln rupees). * HERO MOTOCORP: The company expects stronger international sales growth in the coming years, supported by its entry into many countries as also a slew of brand initiatives. * HEXAWARE TECHNOLOGIES: Expects earnings for Apr-Jun and Jul-Sep to be the most robust in 2018, Chief Executive Officer R. Srikrishna said. Chartered Accountants as the statutory auditors of the bank for 2018-19 (Apr-Mar). The board will meet today to discuss the appointment of a new chairman from a shortlist of four former bureaucrats who have worked with the finance ministry. * ICRA: Punjab National Bank has sold 330,000 shares or 3.3% stake in the company at 3,291 rupees through a bulk deal on the BSE. 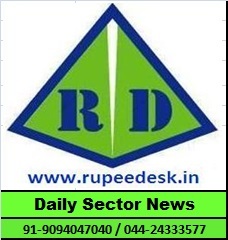 * IDBI BANK: The Insurance Regulatory and Development Authority of India is likely to approve Life Insurance Corp's proposal to pick up a substantial stake in the bank, paving way for capital infusion of about 130 bln rupees. Is looking to increase the share of the retail loan book to 29% this fiscal year from 25% last year, an official said. Realigning its home loan slab in line with new home loan priority sector lending norms issued by the Reserve Bank of India, the bank on Thursday said it will offer up to 15 basis points concession to home loan borrowers based on their credit score. The United Forum of the bank officers and employees has conveyed its serious concern to the finance minister over the government's "move to sell a significant stake in the bank to Life Insurance Corp of India". * JET AIRWAYS INDIA: Which on Thursday introduced the Boeing 737 MAX aircraft to its fleet, said the fuel-efficient aircraft will help the company reduce costs and improve efficiencies. * JINDAL STEEL & POWER: The divestment of 1,000 MW thermal power plant of subsidiary Jindal Power at Raigarh in Chhattisgarh to JSW Energy has been postponed till Jun 30, 2019. * KALPATARU POWER TRANSMISSION: Has received four orders worth 12.35 bln rupees. distribution of their offerings across India. Nomura India Investment Fund has sold 1.28 mln shares or 1.1% stake in the company at 137.02 rupees a share through a bulk deal on the National Stock Exchange. * NBCC (INDIA): The government has said the company and Central Public Works Department will re-work the plan for redevelopment of seven government colonies in Delhi to avoid cutting trees. * NEWGEN SOFTWARE TECHNOLOGIES: Has received an order worth 639.3 mln rupees for document management system and digitisation of judicial records in Maharashtra's district and subordinate courts on turnkey basis. * NTPC: Plans to pick up some stressed power assets when they undergo insolvency process in the National Company Law Tribunal, Chairman and Managing Director Gurdeep Singh said. * PRAKASH INDUSTRIES: Trial production has commenced at the company's flexible packaging plant at Kashipur, Uttarakhand, and commercial production is likely to commence from next week. * PTC INDIA: UBS Principal Capital Asia has sold 1.62 mln shares or 0.5% stake in the company at 73.08 rupees apiece through a bulk deal on the National Stock Exchange. * PUNJAB NATIONAL BANK: The Enforcement Directorate on Thursday filed a charge sheet against Mehul Choksi and 13 others, including five companies, in the 143.57-bln rupees scam involving the lender. * RBL BANK: Private equity fund Gaja Capital has sold a part of its stake in the bank for an undisclosed sum to US-based mutual fund Wasatch Funds via a block deal making eight times return on its investment. * RELIANCE INDUSTRIES: Has submitted an application to the Reserve Bank of India seeking its approval for merger of the company's US-based subsidiary Reliance Holdings USA Inc with its domestic subsidiary Reliance Energy Generation and Distribution. Subsidiary Reliance Retail is entering wholesale fashion and lifestyle products segment through both offline and online channels, as the company's unit aims to tap the largely unorganised bulk business of garments and accessories. Subsidiary Reliance Jio Infocomm is offering a cashback of 1,800 rupees to subscribers who purchase 4G smartphones from Oppo. * RPP INFRA PROJECTS: Albula Investment Fund has bought 115,000 shares or 0.5% stake in the company at 215 rupees a share through a bulk deal on the National Stock Exchange. * SHREE RENUKA SUGARS: Wilmar Sugar Holdings has acquired 378.87 mln shares or 19.77% stake in the company through an open offer on Tuesday. * STATE BANK OF INDIA: Managing Director B. Sriram has resigned from the bank after his appointment as chief executive officer of IDBI BANK. Has refused to disclose details of buyers of electoral bonds, political parties which have redeemed these and the bank's reports sent to the government on their sales, calling it a personal information held by it in fiduciary capacity exempted from disclosure, an RTI response shows. * STRIDES SHASUN: Birla Sunlife Mutual Fund has bought 500,000 shares or 0.6% stake in the company at 388.94 rupees apiece through a bulk deal on the National Stock Exchanges. * SUDARSHAN CHEMICAL INDUSTRIES: The company's board, on Wednesday, has given in-principle approval for the transfer of the agro formulation brand business for a fixed consideration of 70 mln rupees and a variable component in terms of royalty payable on sales. * TATA CONSULTANCY SERVICES: Grew its revenue in the double-digit range in France to $200 mln in FY18, the first time those figures have been disclosed, and expects growth to rev up as the European economy improves. * TATA MOTORS: The company redeemed 4.625%, 2020 senior notes worth $237.47 mln post completion of buyback tender offer. Jaguar Land Rover, a subsidiary of the company, launched the 2018 model of the Range Rover series in India, in both diesel and petrol variants. * TATA STEEL: Thyssenkrupp AG and the company are closing in on a European steel joint venture after a last-minute change to the deal terms that won approval from Thyssenkrupp's union. Liberty Steel is confident that its highest bid to acquire Bhushan Power and Steel will get the National Company Law Appellate Tribunal's approval even as the committee of creditors in its last meeting selected the company, the second highest bidder for the stressed asset. * TITAN CO: Rakesh Jhunjhunwala, others sold 2.67% stake in the company through open market. * UNIPLY INDUSTRIES: Premier Investment Fund has sold 800,000 shares or 2.8% stake in the company at 76.20 rupees through a bulk deal on BSE. * UTTAM VALUE STEELS: The National Company Law Tribunal's Mumbai chapter has rebuked the STATE BANK OF INDIA for its "lackadaisical approach" in sanctioning a 3.34-bln-rupee loan to the company. * V2 RETAIL: India 2020 Fund II Ltd has bought 200,000 shares or 0.6% stake in the company at 405 rupees apiece through a bulk deal on the National Stock Exchange. * VEDANTA: The board of will meet on Tuesday to consider raising up to 15 bln rupees through issue of non-convertible debentures, in one or more tranches. Germany and the UK have been completed on Wednesday, for consideration of $399 mln. Has removed US President Donald Trump from the risk factors in its annual filing with the US Securities and Exchange Commission, a year after the IT services company named his policies as a potential threat. * ZEE MEDIA CORP: Board has approved the sale of its entire 40 mln shares in wholly-owned subsidiary Ez-Mall Online to Altilis Technologies, a promoter group entity, at an aggregate amount of 86 mln rupees.